This isn't like normal Urban Fantasies that I usually read. I still did like it though but its more just about Kate being an actress and learning she is this sentinel person and that she can now make the gargoyles go back to sleep if she accepts the position and her ex-boyfriend brings real life problems to her paranormal ones. I would have liked to see more about the gargoyles or anything more on the paranormal beings. I mean you find out you are in charge of this gargoyle army and you put them all back to sleep? Come on raise a little hell, there could be so many issues that arise from that plot point alone! I am not sure if this is going to be turned into a series or is just a stand alone but I feel there should be more this would be a good first book to a series, but maybe not so much alone. I know she did have issues with the gargoyle what with seeing killings through there eyes but there could have been so much more I think. Anyway enough of that I loved the cover of this book and once I read the synopsis and saw it had gargoyles in it I had to get my hands on it. Being someone who has grown up and watched the Gargoyles cartoon show, I had to see what this book was about. I have found a few books that have gargoyles in them but of course I want to read even more about them. I would like to know more about Declan he was a big mystery that I would like to solve and hear about what happened to him in his past. Kate was an okay character I didn't mind her too much though for someone that wanted to feel the thrill of life and live dangerously didn't sure take the bull by the horns in the supernatural aspect. I did like the scene where she is on her bike and then again driving in the car. I think what kept it interesting for me was that sometimes the chapter switched to a different characters point of view. I liked that gives me different angles to see from rather than just the main characters. I am not really going to touch on the love interest really since it seemed quick and just budding at the end. Though I will say Ian is a good match for her and that he will help her along the way. 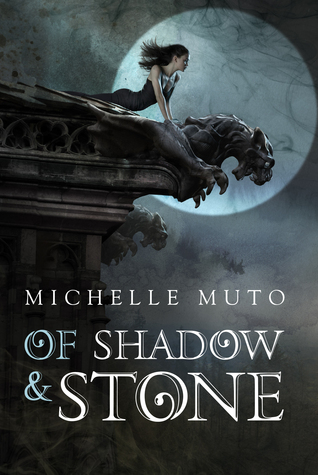 Michelle Muto states on her blog she doesn't write cliff hangers in books this is definitely true at least for this book at least everything is wrapped up nicely by the end. Though there are some mysteries I would love to delve into if this did continue on. If you would like to check out Michelle Muto and her other works please visit her blog here: https://michellemuto.wordpress.com/. I got this from netgalley sometime back,and I totally forgot about it and it's buried in some corner of my kindle:)I think I should get around to read it soon. Thanks let me know how you like it.